According to American novelist Fanny Fern,''a way to a man's heart is through his stomach''. This means that a woman can make a man love her by cooking good meals for him. Valentine day is here again, skip the fuss of making a fancy dinner reservation for this year and spend the night in making a delicious meal for your partner. Valentine's day is a day which romantic love is celebrated among the married, engaged and dating couples, where they should feel inspired to show their affection for each other in extraordinary ways.An extraordinary way to express your love and affection is through preparing special dishes for your partner that special day. Also to ladies in relationships, preparing mouthwatering dishes for your man on valentine's day can make him drop to his knees to propose marriage. Not leaving the married women out, doing something extraordinary like cooking a sumptuous meal for your husband on that special day renews your union and strengthens the bond. PrimeNewsGhana has gathered some romantic Ghanaian dishes to prepare to ''wow'' your partner on valentine's day. Amongst them are Palmnut soup(Abenkwan) with fufu, Grilled tilapia with banku, kenkey and fried fish, fried pork(domedo) with fried yam, Chicken Jollof rice, Garden eggs stew with plantain, Okro stew with banku, Palaver sauce(Nkontomire stew) with Ampesi(boiled yam), Groundnut soup with Omo tuo(rice balls), Goat light soup with fufu and Beans stew with fried plantain. Palm Nut Soup(Abenkwan)is a soup made from the palm fruit.The delicacy is accompanied with fufu, ingredients used in preparing it include, palmnut, onion, pepper, fresh tomatoes, tomatoes puree, fish, meat, seasons(salt,Maggi cube, ginger), cassava and plantain. Seasoning tilapia with ginger, garlic, onion, Maggi cube to grill is the best one could taste on a special day like Valentine's day.Grilled tilapia is accompanied with hot pepper and banku. Ingredients for the preparation of banku are corn dough and cassava dough and salt to taste.Serve hot banku with black or grind pepper. Domedo is accompained with crispy fried yam.Ingredients used in preparation is pork belly, onion, garlic, salt, oil for frying,yam.Serve domedo with hot pepper and sliced fried yam as a special valentine's day meal for your partner. Garden egg stew is accompained with plantain.This is another delicacy to ''wow'' your partner on valentine's day.Ingredients for preparation are garden eggs, onion, tomatoes, pepper, salt, ''m)m)ne'', fish, hide(wele), Maggi,salt,red oil and plantain. Okro stew is served with banku. Ingredients needed in preparation are okro, garden eggs, onion, tomatoes,pepper ''m)m)ne'', ''kako'', fish, crab, hide(wele), snails, cow feet, Maggi cube, salt, red oil, corn dough and cassava dough.This is one delicacy loved by most Ghanaians and one of the best to prepare for your partner on valentine's day. Nkontomire stew is accompained with boiled yam.Ingredients used in preparation include Spinach leaves(nkontomire), red oil, m)m)ne, onion, pepper, tomatoes ,''agushie" (shelled grind melon seeds), Maggi, salt, hide(wele), fish, yam. Groundnut soup is another delicacy enjoyed by most Ghanaians,preparing it for your partner on valentine's day will not be an exception.It is accompained with Omo tuo(rice balls).Ingredients in preparation are groundnut paste, fresh tomatoes,tomato puree,onion,pepper,fish,chicken,chicken stock,Maggi,salt,rice. Fufu is an irresistible delicacy enjoyed by most Ghanaians.Make it special this valentine's day for your partner .Blow the mind of your partner on valentine's day with light goat meat with fufu.Ingredients for preparation are goat meat,onion,pepper,tomatoes,tomato puree,ginger,garlic,Maggi,salt,cassava,plantain. Beans stew is accompained with fried plantain. 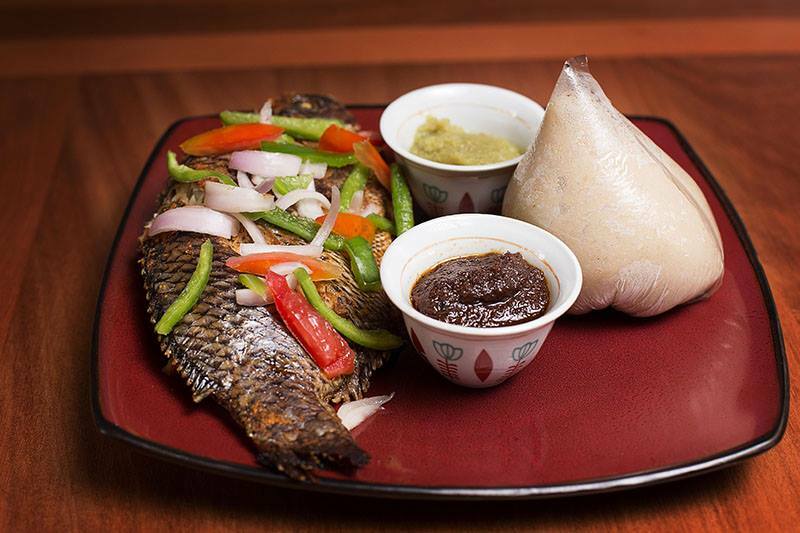 ''Wow'', your partner on valentine's day with this sumptuous Ghanaian delicacy.Ingredients used in preparation are beans,onion,tomato,pepper,salt,red oil,fish,cooking oil(sunflower oil),ripe plantain. Chicken,Onions, tomatoes, Kpakpo shito (hot green pepper),blend of spices (ginger, garlic, onion, bay leaves, cloves, rosemary), tomato puree, curry powder,cooking oil,Maggi cubes, Salt to taste and peas. *First start by cutting up the chicken into equal parts, and wash thoroughly. Drain of all the liquid from the chicken. *Blend the of spices(ginger,onion,garlic), pour it on the chicken and add 1 maggi cube and a bit of salt. Toss it all until all the pieces of chicken are coated.Leave it for sometime for the chicken to be spiced well. *While waiting for chicken to spice, wash pepper,onion,tomatoes and slice the onions,tomatoes. blend the tomatoes and pepper. *Place the spiced chicken in a cooking utensil,add a little water and steam until tender. *When it is cooked, remove it from the stock, but save the stock ,it will be added to the stew to enhance the taste of the meal. *Heat oil in a pan and fry the chicken, turning it over until it is light to golden brown on both sides. *While the chicken is frying in a frying pan, put a cooking utensil on the fire ,heat oil and pour sliced onions toss the onions and fry till they soften,add tomato puree and stir thorougly, when they soften add the curry and fry until the edges start to brown. *Add the blended tomatoes and pepper. Cover for 5 minutes to cook the tomatoes, then uncover and allow it to fry dry, stirring it occasionally and not letting it stick under the utensil.Afterwards, add the chicken stock. *Whilst cooking the stew for the jollof,the chicken should also be monitored to prevent it from burning.When all are fried, remove from the oil while in a colander to drain excessive oil from the fried chicken. *Check on the stew and add rice to it,add Maggi cube to it and stir thoroughly. Add salt to taste. Add about 6 kpakpo shito to the rice and allow to simmer. *Cover the rice with a plain rubber or a clean napkin.It will aid the rice to cook. *Lastly,Check it after 15 minutes, stir it from the bottom, with a ladle. If it seems dry, sprinkle about 1/4 cup of water into it using your hand. Cover it back up and leave to cook some more. *When jollof rice its cooked , serve in a plate and garnish with fried chicken, peas.